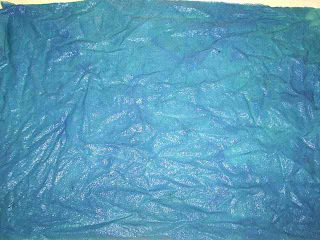 Today Deb Donnelly (textile tutor at Whitireia Polytechnic) and I made an Indigo Dye bath. 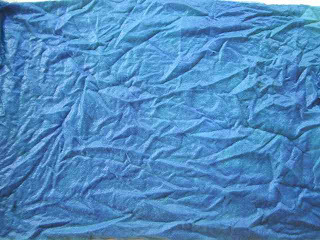 I have used Indigo before but someone else has always been in charge of getting the the dye bath set up and working and they have always made the recipe seem incredibly hard to follow with complicated ingredients which are hard to get. The recipe we chose to use, used washing soda crystals and Color Run remover, from the supermarket. 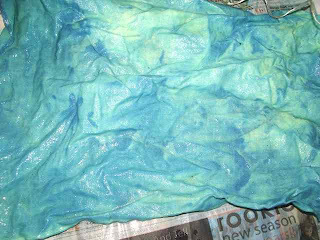 It worked really well and it is just magic seeing the fabric come out of the dye bath looking yellow and then slowly turn turquoise and then blue as the oxygen gets to it.